A student teacher used a graphic organizer with a lightening speed video in a World Honors history class for seniors. The teacher cleverly slowed the lesson down after the first quick showing, and the clips framed the lecture into a pleasing package! So I clicked on the video and it has inspired me since. The more I think about this it, the more I am impressed with the choreography that we do not see. Mathew Jeffers’ sent this e-mail to the Ravens’ football coach, but the multimedia composition that extended Jeffers’ voice to the 146,285 viewers since its Jan. 31 post (which really only reflects some of the audience since videos are viewed by more than one person at a time AND it was broadcast on ESPN) is powerful. The relational development that is discussed in Baym’s (2010) Personal Connections in the Digital Age has a more complex web in this example, because not only are Jeffers, the coach, and players connected, but Jeffers’ message inspired thousands. The composition of this piece involved thoughtfulness, work, and time. Contacts and permissions must have been granted, interviews held, video clips chosen, music selected, and then the video was crafted. I wonder how long that all took. I appreciate the effort, because the message is enduring. The CHEP conference offered new experiences. 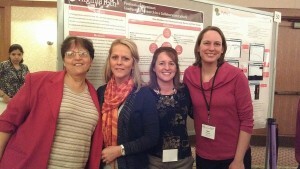 It was my first time participating in a poster session and a research session. I learned from speaking with a marketing professor from New Hampshire that visited our poster session that we should have used a QR code. He introduced me to QR codes through Google, which will keep your stats regarding how many people have visited your site. The research session on digital internships introduced me to the deep thinking of scholars. 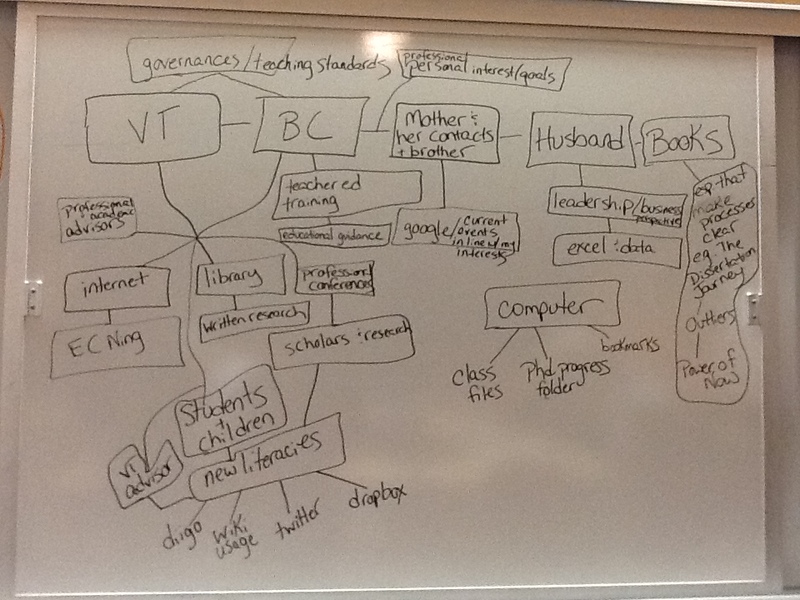 Participants in our session had insights into our research that broadened my view of what we were doing. I learned from CHEP 2013 to be careful what you wish for. I did not expect all 4 of the proposals that my name was on would get accepted, so I set myself up for a lot of prep. The fourth presentation was a practice session , with my advisor Dr. Katie Dredger and my office mate Paige Horst, on using Web 2.0 tools for reflection with preservice teachers. Since I did a practice session last year, I was much more comfortable presenting this time around. 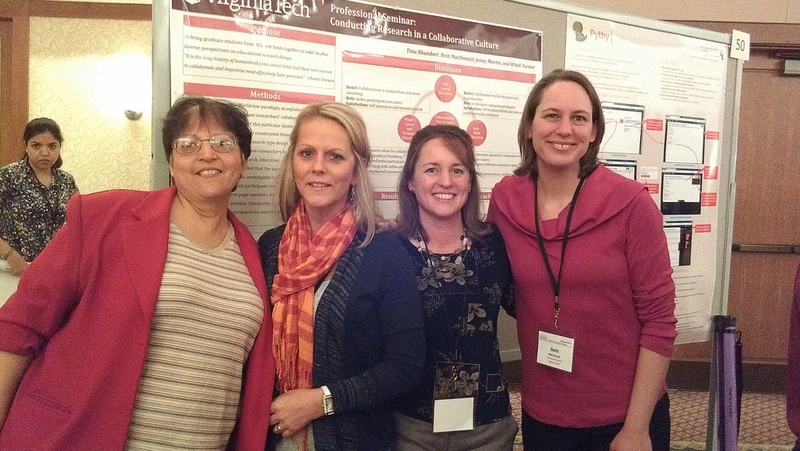 Two poster presentations with Naina Bhandari, Windi Turner, Jenny Martin (me) and Beth MacDonald at last week’s Conference of Higher Education Pedagogy. My name is Jenny Martin, and I am a graduate teaching assistant working toward my PhD in Curriculum and Instruction at Virginia Tech. At Virginia Tech I am enrolled as a full-time student, and my GTA duties involve teaching a class entitled Teaching Adolescent Readers and supervising student teachers placed in middle and high school English classes. I also serve as an adjunct instructor at Bridgewater College where I co-direct the Shenandoah Valley Writing Academy, supervise student teachers, and provide Praxis support. I use a 32 GB ipad, property of Virginia Tech, mostly for reading journal articles, e-books, and note taking. The ipad was provided in a course I am enrolled in, and now I wonder how I lived without this friend that has significantly lightened my load and curtailed much wasted paper! There is nothing better than trading in stacks of heavy books for compact technology. I tote my wheely bag around campus and to children’s events a lot less, and it’s nice to have the camera and video tools on hand. My laptop is a Dell Inspiron, and when I am working on my literature review, in preparation for my dissertation, I also use my Toshiba laptop so that I can have both screens working for me. To back up files, I use a portable external hard drive. Occasionally I’ll use a jump drive, but rarely. With a family of five, coordinating children’s activities, and living away from home three days a week I find dropbox vital. In dropbox I keep a single spreadsheet entitled “weekly calendar” that is shared with my husband and both sets of grandparents. Each Sunday I update the weekly schedule that includes children’s names with activities and who is providing care/transportation to each event, chores that rotate among the kids, evening meals, phone numbers, and bus times. For school and work I use dropbox to organize mostly assistantship files and student teaching files for my adjunct position. Beyond dropbox, I use Microsoft Word for typing papers, Google documents, excel speadsheets, wikispaces, wordpress, and I’m trying to get comfortable with Google sites. What would be my dream setup? Now I see the value in an ipad, and I would love to own my own. When it’s time, I’ll buy an origami cover to go with it. I look forward to having an office at a small liberal arts school with one computer and two screens provided by the school. The idea of having one office to put my work belongings sounds very appealing to me right now. At home I’ll use my laptop, and once I’m employed full time I’ll buy the newest version of the smartphone and get the family connected through Google calendar. As I was reading Networked, I was not too surprised to see that more than 3/4 of teenagers and 2/3 of adults have created content online. What does surprise me is that when I mentioned wikis in a conversation around a group of 8 male and female students last year, they said, “What’s a wiki?” Does this reflect the cultural inertia that may exist in our schools? 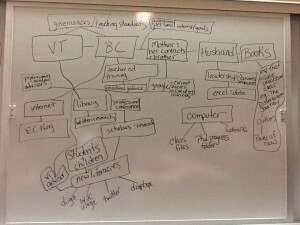 Wikis are amazing collaborative spaces that could be rocking the schoolhouse. My 14-year-old daughter was one of the kids in that group. She likes to go in her closet, yes- literally in her closet- with her ipod and a family lap top. Does this sound like we’re breaking all the rules for parenting and computer use? There is more. The closet has a spot that wraps around part of our chimney that makes for the perfect private spot. Inside this closet she has blankets, a queen pillow, and the ceiling is lined with white Christmas lights. So, she likes to go to this spot and use ooVoo to visit with friends and to get a little studying done. My daughter’s bedroom is on the second floor, and her closet wall adjoins the small, but high ceilinged living room on our first floor. We live in a 30+-year-old log home, and what I’m trying to say is the privacy of her spot is really a facade. When my husband and I are in the living room, we hear everything. A benefit that we enjoy. So, back to Networked. As I read about the percentage of students active in creating online content and thought about my daughter studying with friends in her closet using ooVoo, one sentence in the book struck me: “Networked individuals have new powers to create media and project their voices to more extended audiences that become part of their social world” (loc. 490 on the kindle e-book). So why aren’t we enabling more students in school to use these technologies they enjoy in purposeful ways? Why not teach them how to leverage these new literacies to make purposeful digital footprints that reflect goals, communicate needs, explore interests, and share knowledge? I wonder about the possibility of using ooVoo in conjunction with collaborative writing and Google documents to engage students in writing. I’d like to do something similar to this collaboration with digital internships but perhaps use 9th graders from different high schools, yet situated close enough so that the students could get together and meet each other in person. The collaboration might kick off with a get-to-know you breakfast at a local bagel shop. I think we have the tools in education; we just don’t always use them as well as we could. I think Justin Reich would agree with me on that one.